And here we have wonderful new cover stories in the soon to be released Entertainment Weekly magasin! Andy Serkis talks about the Hobbit Films to BBC Radio 5 Live. The Hobbit Films production he says has “been a long time coming and it’s finally happening”. 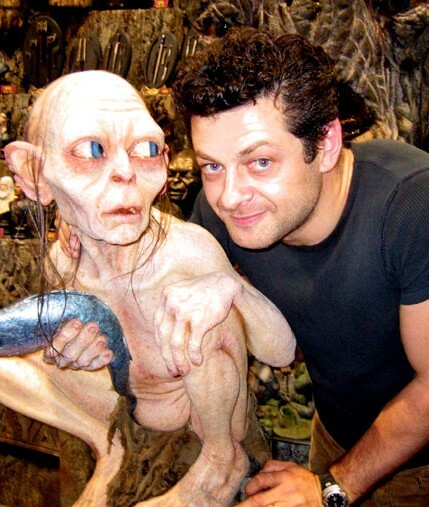 Andy Serkis, who reprises his role as Gollum, in The Hobbit Films, is now about to serve as a second unit director on the films as well. The actor also has performances in two additional anticipated movies are on the way, both of which are performance capture. He will play Caesar in the Planet of the Apes prequel Rise of the Apes, slated for an Aug. 4 debut; and Captain Haddock in the December release The Adventures of TinTin: The Secret of the Unicorn. Gollum is a fictional character from J. R. R. Tolkien’s legendarium. He was introduced in the author’s fantasy novel The Hobbit, and became an important supporting character in its sequel, The Lord of the Rings. Gollum was a Stoor Hobbit of the River-folk, who lived near the Gladden Fields. Originally known as “Sméagol”, he was later named “Gollum” after his habit of making “a horrible swallowing noise in his throat”. His life was extended far beyond its natural limits by the effects of possessing the One Ring, which enslaved him to the point that he pursued it for the rest of his life after losing it to Bilbo Baggins. During his centuries under the Ring’s influence, he developed dissociative identity disorder: “Sméagol” still vaguely remembered things like friendship and love, while “Gollum” was a slave to the Ring who knew only treachery and violence. In The Two Towers, Samwise Gamgee named the good personality “Slinker”, and the bad personality “Stinker”. 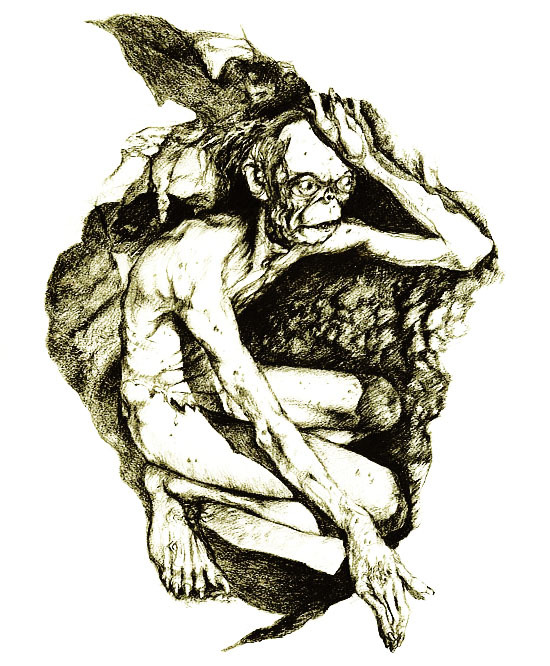 The two personalities had a love/hate relationship, and often quarrelled when Gollum talked to himself (as Tolkien puts it in The Hobbit, “through never having anyone else to speak to”). Gollum first appears in The Hobbit, where the protagonist Bilbo Baggins stumbled upon Gollum’s lair and found the Ring which Gollum had lost in the network of caves leading to the lake. Gollum had dwelt under the Misty Mountains for five centuries, living on a small island in the centre of a lake at the roots of a mountain. He survived on cave fish, which he caught from his small boat, and small goblins who strayed too far from the stronghold of the Great Goblin. Over the years, his eyes adapted to the dark and became ‘lamp-like’, shining with a sickly pale light in the dark. In the first edition of The Hobbit, Gollum did not appear quite as wretched or murderous, and indeed showed Bilbo the way out after losing the riddle-game. Tolkien changed his characterization in the second edition, to fit the concept of the ruling Ring which he had developed during the writing of The Lord of the Rings. Tolkien then explained that the version given in the first edition was a lie that Bilbo made up to justify to the Dwarves and Gandalf his possession of the Ring.